DR. WILY'S CASTLE – Adorned in a festive red cap and surrounded by his robot creations, Dr. Wily paced in fury around the main chamber of his iconic, byzantine, skull-shaped castle. "I just want to know, okay? Who's the comedian? Which one of you thinks you're so damn funny?" the mad scientist demanded to know, pausing briefly in front of a short robot with a log-shaped head and body and leaning in closely to scrutinize its face for any indication of responsibility. "WAS IT YOU, WOOD MAN? I KNOW IT WAS YOU." The stout, brown robot's mechanical pupils dilated immediately to the size of saucers, and it began to cough frantically, ejecting flecks of peanut brittle from its mouth and onto Dr. Wily's red-and-white holiday lab coat. "It wasn't me, Dr. Wily! I swear!" hacked Wood Man, still choking on his mouthful of candy. Dr. Wily continued to eye the plump robot suspiciously for a moment before moving on, satisfying himself that this betrayal was not likely the work of Wood Man, one of his simpler fabrications. "I made every last one of you – don't you forget that!" announced Dr. Wily to the room, his eyes scanning mistrustfully. "And don't you think for a second that I won't dismantle every last one of you ungrateful rust buckets LIKE THAT!" To emphasize his threat, Dr. Wily tore the cap from his bald head, threw it angrily onto the ground, and proceeded to stamp it with his feet, tattering the red fabric. "Whoever you are, you're ruining the party for everybody!" The source of Dr. Wily's indignation – the final, anonymous offerings in his annual "white elephant" gift exchange, the one that he himself opened – still lay on the cobbled floor where he dropped them in dismay: a small, compact florescent lightbulb decorated in an even smaller white beard and lab coat and a flat, grey rock with the word "MAN" painted on it. "You know, I, too, have a sense of humor," said Dr. Wily, leaning down to pick up the offending items. "And these," he said, raising the bearded bulb and painted stone above him, "How clever! Please, whoever made them, identify yourself so that you may be rightly recognized for your creativity!" 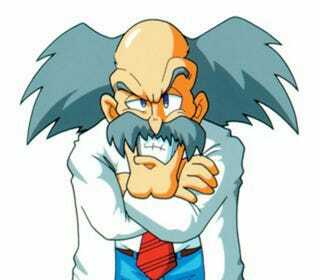 Dr. Wily waited in hostile silence. When it was apparent that no one would come forward, he smashed the bulb on the ground and threw the rock at Quick Man, who proceeded to dodge, and instead struck Guts Man in the chest. "Oww," responded Guts Man, rubbing the spot where the rock hit him and frowning. "ARGH!!!" bellowed Dr. Wily in futile frustration, storming from the room and instructing his minions to get out of his way and get out of his castle because the party was over and there would never be another holiday party ever again. And, as the robot masters shuffled to the exit, Bubble Man secretly smiled. You can also say hello at themushroomnews@gmail.com.